For those who define themselves by the arcane, these guidelines may be the only truths in their lifetime – a fact known all-too-well by today's focus: The Elves. From chiefs of a magocratic empire to the doddering addicts of arcane power, the elves have run the gamut of magical practice on Azeroth. For them, magic is more than a simple force: It is a heritage, a birth right, ingrained into the elven culture, landscape, and genes. What import is to be derived from this history? What can we, as roleplayers, learn from a people so far apart? This is the subject of today's Lore Lesson – an up and close look at the great lessons that magic, and it's chosen people, have to share with us. Long ago, at the far beginning of the world, there was the Well of Eternity. This was the wellspring of magic, the true heart of life on Azeroth. The Titans, those enigmatic creator deities, had left the Well in the wake of their departure, to serve as testament to the great realm they'd constructed. From it's mystic pools bled the first spells. From it came the first life. Among those myriad creatures to emerge from the Well, none were so populous and proud as the Trolls. Carving a vast empire out of the woodland dark, they came to reign as the supreme force of the ancient world. Gifted with a latent savagery, and beholden to dark gods, they would perceive all land as belonging to them – by issue of blood if not divinity. Yet there was one tribe not so given to conquest. Where the others would break and tear into the woodlands, one would remain on the mystic shores that had beget them. These mystics peered into the Well, drinking deep it's potent waters. The nascent tribe grew devoted to the Well, whose waters granted tremendous gifts: granting strength and long life, expanding their consciousness beyond that of their savage kin. In time, the arcane waters began to have a transformative effect, causing the trolls to mutate entirely. Thus the Elves first came to be. They called themselves the Kal'dorei, or Night Elves – 'Children of the Stars.' Their workings were grand, backed as it was by the magic of the Well. With this power they would go to mete a bloody verdict on the Trolls, overthrowing an empire which even the Gods gave homage to. So the power of magic was made evident to all, and it's first cardinal lesson of Power established. Assured by the victories, the Night Elves went on to form their own civilization, carving a resplendent empire out of the ashes of trollish hierarchy. Along the shores of the mystic Well cropped a grand palatial suite, wherein dwelt the most gifted Kal'dorei sorcerers. Dedicated to unraveling the Well's mysteries, these Quel'dorei, or 'Highborne', would form the upper-caste of Night Elf society, with the most powerful serving for imperial leadership. 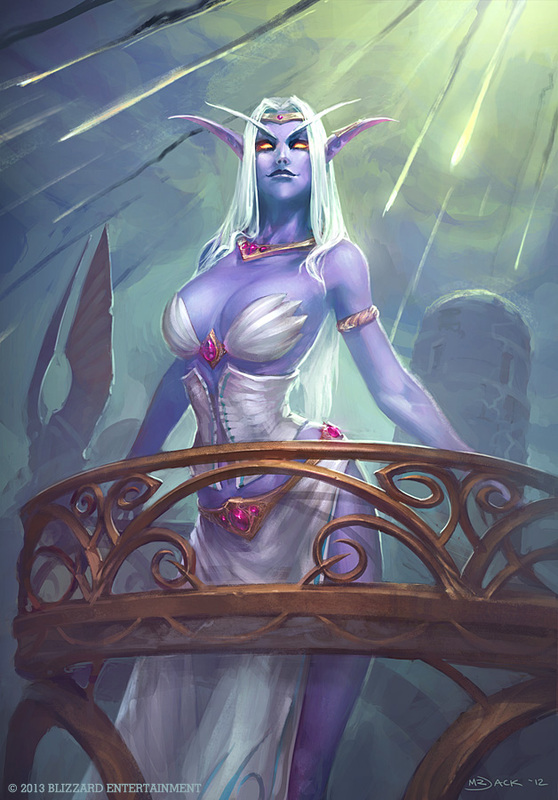 Her name was Queen Azshara, and to stand before her was to know Elune herself. To her was dedicated the great striving of the Quel'dorei magicians. To her was beholden the whole of Elven society. Her coronation was said to have lasted days, with the very capital being renamed in her honor – Zin-Azshari, 'The Glory of Azshara.' But as her vanity extended, so did the Queen's want for power. Though she had indeed mastered the greatest power in the cosmos, and conquered the borders of the known-world, she still felt unfulfilled, as if owed some greater promise. That promise would manifest itself in the wrods of Sargeras, the Dark Titan. Reaching his mighty consciousness through the Well, he produced a dread compact for the Elven leader: Allow him entry into Azeroth, and she would know power eternal under his wing. So it was that vanity lead to the first disgrace of the elves. So it was that Elves learned the Fourth cardinal rule. Infernal stone rained from the sky, scoring centuries old cities from the earth. The seas boiled over and became as blood. Ancient races were displaced from their halls. Dragons fell. Gods died. In this apocalypse and ardour the low-born elves arose, devising a damning strategy: Stop the invasion at it's source, and seal the Well entire. Their gambit worked, but at a price. All at once, the Well began to erupt, splitting the singular continent into the landmasses of today. This violent collapse resulted in the total destruction of the Night Elf empire, leaving the survivors to scratch a living from the remnant woods. Vilified for their misdeeds, and cut off from the source of their power, the surviving Quel'dorei were banished across the new-formed sea. There, on the far shores of an alien continent, they forged their empire anew, establishing a new Well with the remaining waters of the old. This Sunwell, as it came to be called, suffused the remaining elves with power, granting the magic necessary to eke a living in the far shores of the world. To commemorate this renewal, and the great turbulence which they'd suffered, the Quel'dorei cast a spell of eternal springtime on the surrounding woods. The Quel'dorei had learned well from the past. Though they touted themselves as masters of magic, the elves, as a whole, forwent the indulgent practices which so debased their forebears. Embracing lives of temperance, these pioneers erected mighty portcullises and carved various runestones – forever shielding the land from incursions temporal or demonic. Thus segregated, the High Elves remained aloof, forever free to practice their arts. So Quel'thalas, the High Home, came to be. So the Sunwell yielded it's blessing. And so it went, for many millenium. It took less than a year for the Scourge to overrun Quel'thalas. The ensuing invasion saw the ruling Sun King murdered, the Sunwell destroyed, and the surrounding woodlands corrupted. To this day the Dark Scar remains, checked but forever teeming with the skeletal remain of the greater elven populace. As a reminder of these traumas, the High Elves took the name Sin'dorei, Children of the Blood. Yet the shame they suffered at this holocaust was nothing to the debasements which followed. The Sunwell, long the center of their universe, had engendered in it a dependency, nurturing an addiction in each of the remaining elves. Without it's latent energies, the elves quickly grew despondent, sometimes lapsing into outright violence, or transforming the into mana-crazed beasts. For the survivors to endure, they had to find a new source of arcane power. This source manifested itself in the eldritch entities of the Twisting Nether. Yet while feeding on demonic energy suffused the elves with power, it also drove them to a darker end. Outcast and villified by the rest of Azeroth, they would go on to find a new home in the shattered wastes of the Orcish homeworld. There, on the utmost edge of reality, the Sun King Kael'thas Sunstrider, pledged himself to the forces of the Burning Legion. 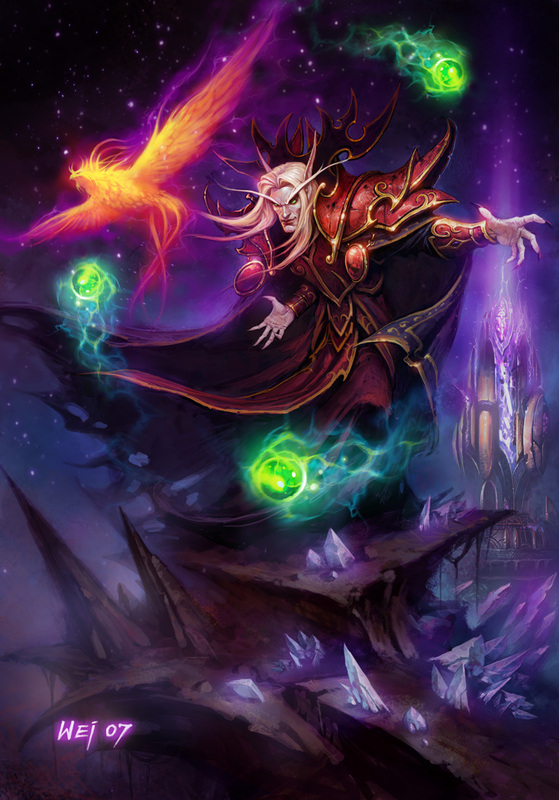 In a dark mimicry of Azshara's fall, Kael'thas would forge a dread compact with the demon lords: Invite them into Azeroth, and the Blood Elves would have all the arcane power they would ever need. Although his plan failed, the ensuing war nearly destroyed the remaining elves, and brought great shame from the rest of the world. Now, the Sin'dorei find themselves laid bare, beholden to the good graces – and, as some would, mercy – of a barbarian Horde. Their golden homeland, once proud and separate, is now open and desecrated, forever baring the black mark that nearly ended them. There is no question of the power in roleplaying. It possesses the magic of imaginations shared, of minds conjoined. To make a story with another person, to open yourself to their mind, is definition of telepathy. Sometimes, it seems there's no end to the power contained in roleplay. At others, it seems like a furtive thing; something extinguished and forgotten in the tumults of our life. Yet we remain compelled, beholden still to the magic of that first creative joining. This is the weight that the elves themselves still bare. In their quest for that compulsion – that feeling of magic – they spared nothing, going forth to a dark end. It lead to a twin disaster, costing them their King, and nearly destroying the remainder of their people. Yet, they remain stuck in their ways, forever searching for more of that same power. This, then, is the lesson of elven lore. Perhaps you think that your source of power is extinguished. Maybe you think that you're beholden to – and no longer the master – of your own creative impulses. Do not allow yourself to become swayed by this, though; Continue on, and let your impulse flourish. Follow it, but do so with the understanding that it is only one part of your being. Do not become so enamored that you lose sight of what is important. To be enslaved to magic is no mastery at all – but to use it for a good end, and the benefit of your people and your life… That's the rub, my friend. I leave you, then, with the words of Stephen King – a real master of storytelling, and the main inspiration for this article. Probably, he'd be laughing if he knew that he was included in an article about video game elves, but hey, we gotta take what we can get. Are you holding your roleplay to inordinate standards? The heroic journey always takes us somewhere bleak. The struggle is not in avoidance, but in perseverance. Live the adventure. Make the myth. Roleplay has helped me - now it's your turn. Discussing the redemptive aspects of roleplay; it's positive effects on our lives, and the continuing journey of self overcoming.